Sonchus tenerrimus and Sonchus oleraceus infest many crops in Italy, especially in the Southern area of the peninsula. They are considered good tasting edible plants and are cooked with spaghetti. Sonchus hierrensis in the Canary Island of La Gomera. Sonchus is a genus of flowering plants in the dandelion tribe within the sunflower family. Most of the species are annual herbs, a few are perennial, and a few are even woody (subgenus Dendrosonchus, restricted to the Canary Islands). Annual herbs in the genus are known as sow thistles (less commonly hare thistles or hare lettuces). The genus is named after the Ancient Greek for such plants. All are characterized by soft, somewhat irregularly lobed leaves that clasp the stem and, at least initially, form a basal rosette. The stem contains a milky latex. Flower heads are yellow and range in size from half to one inch in diameter; the florets are all of ray type. Sonchus fruits are single-seeded, dry and indehiscent. Sow thistles are common roadside plants, and while native to Eurasia and tropical Africa, they are found almost worldwide in temperate regions. Mature sow thistle stems can range from 30 cm to 2 m (1 to 6 feet) tall, depending upon species and growing conditions. Colouration ranges from green to purple in older plants. Sow thistles exude a milky latex when any part of the plant is cut or damaged, and it is from this fact that the plants obtained the common name, "sow thistle", as they were fed to lactating sows in the belief that milk production would increase. Sow thistles are known as "milk thistles" in some regions, although true milk thistles belong to the genus Silybum. Sow thistles have been used as fodder, particularly for rabbits, hence the other common names of "hare thistle" or "hare lettuce". They are also edible to humans as a leaf vegetable; old leaves and stalks can be bitter but young leaves have a flavour similar to lettuce. Going by the name puha or rareke (raraki) it is frequently eaten in New Zealand as a vegetable, particularly by the native Māori. When cooked the flavour is reminiscent of chard. In many areas sow thistles are considered noxious weeds, as they grow quickly in a wide range of conditions and their wind-borne seeds allow them to spread rapidly. Sonchus arvensis, the perennial sow thistle, is considered the most economically detrimental, as it can crowd commercial crops, is a heavy consumer of nitrogen in soils, may deplete soil water of land left to fallow, and can regrow and sprout additional plants from its creeping roots. However, sow thistles are easily uprooted by hand, and their soft stems present little resistance to slashing or mowing. 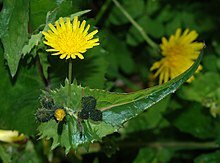 Most livestock will readily devour sow thistle in preference to grass, and this lettuce-relative is edible and nutritious to humans—in fact this is the meaning of the second part of the Latin name of the common sow thistle, oleraceus. Attempts at weed control by herbicidal use, to the neglect of other methods, may have led to a proliferation of this species in some environments. Sow thistles are common host plants for aphids. Gardeners may consider this a benefit or a curse; aphids may spread from sow thistle to other plants, but alternatively the sow thistle can encourage the growth of beneficial predators such as hoverflies. In this regard sow thistles make excellent sacrificial plants. Sonchus species are used as food plants by the larvae of some Lepidoptera including Celypha rufana and the broad-barred white, grey chi, nutmeg, and shark moths . The fly Tephritis formosa is known to attack the capitula of this plant. ^ Lectotype designated by N. L. Britton & A. Brown, Ill. Fl. N.U.S. ed. 2. 3: 316 (1913). ^ a b "Sonchus L.". Tropicos. Missouri Botanical Garden. ^ For a recent review of woody species, see Seung-Chul Kim et al. (1996). "A common origin for woody Sonchus and five related genera in the Macaronesian islands: Molecular evidence for extensive radiation." Proceedings of the National Academy of Sciences USA, 93:7743-7748. ^ Shi, Zhu; Kilian, Norbert. "Sonchus". Flora of China. 20–21 – via eFloras.org, Missouri Botanical Garden, St. Louis, MO & Harvard University Herbaria, Cambridge, MA. ^ R., Walters, Dirk (2006). Vascular plant taxonomy. Keil, David J., Murrell, Zack E. (5th ed.). Dubuque, IA: Kendall/Hunt Pub. Co. ISBN 0757512143. OCLC 62889410. ^ Hyatt, Philip E. (2006). "Sonchus". In Flora of North America Editorial Committee (ed.). Flora of North America North of Mexico (FNA). 19. New York and Oxford – via eFloras.org, Missouri Botanical Garden, St. Louis, MO & Harvard University Herbaria, Cambridge, MA. ^ "Sonchus arvensis". Natural Resources Conservation Service PLANTS Database. USDA. ^ White, I.M. (1984). Tephritid Flies (Diptera: Tephritidea). Handbooks for the Identification of British Insects. 10 pt 5a. Royal Entomological Society of London. pp. 134 pp. ISBN 0901546682. ^ a b "Sonchus". Australian Plant Name Index (APNI), IBIS database. Centre for Plant Biodiversity Research, Australian Government, Canberra. Retrieved 2008-11-02. Low, Tim. Wild Herbs of Australia and New Zealand. Rev. ed. Angus and Robertson, 1991. ISBN 0-207-17001-0. This page was last edited on 1 March 2019, at 06:24 (UTC).